In the heavyweight championship bout of the animal kingdom, a giant crocodile defeated a shark in a TKO – and then enjoyed a victory seafood dinner. 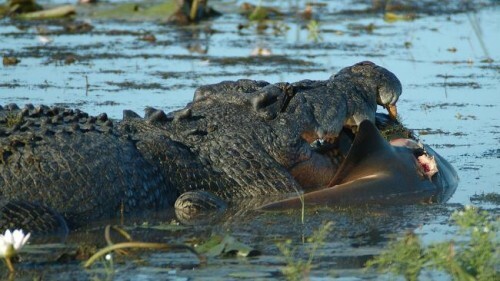 Two boats full of tourists got the photo opportunity of a lifetime after the 16-foot crocodile’s decisive win on a river in Australia’s Kakadu National Park Saturday morning, the country’s Northern Territory News reported. The loser, a bull shark that had meandered up the aptly named South Alligator River in search of food, was about 10 feet long before it was bitten in half. The croc had the home-field advantage because the seagoing shark was swimming through fresh water at the time of the attack. Cameron, a former park ranger, told the newspaper it’s not the first time he’s seen the two species fight for a berth at the top of the food chain.